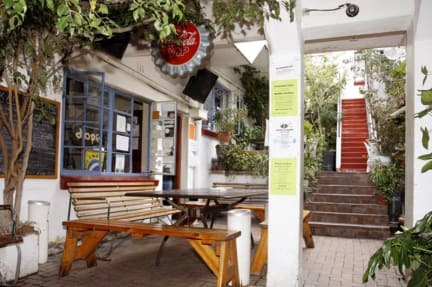 Our famous hostel is situated right in the middle of the CBD in the entertainment precinct of Cape Town. We have been described as 'The Soul of Long Street' (Lonely Planet) - and we hope that's a good thing!!?? Our hostel is a lovely old building at the top end of the street with a sunny and leafy courtyard, fantastic balconies with views onto signal hill and the busy streets. We are an 'old-school' hostel and differentiate ourselves from the new generation of 'poshtels'. We are all about communalism and laid back fun and adventure. We share meals and outings together, we party together (often!!!) and we treat guests and staff alike as part of our weird and wonderful family. It is a large hostel sleeping up to 80 guests and there is never a dull moment or a day without adventure. Dormitory, Single, Twin and Double rooms are all on offer as are communal kitchen, balconies, TV room and pool room. We have literally THOUSANDS of eating, drinking and entertainment options right on our doorstep (and we are neighbors of BEERHOUSE and SGT PEPPERS), so come prepared for fund and ADVENTURE. Remember to bring your passport with you! we take the safety and security of our guests very seriously and for that reason we must insist on ALL guests presenting valid passports to check in.